Mapapadalas nang makita ng Pinoy pageant fans ang Miss Universe 2013 na si Gabriela Isler ngayong nakapagdesisyon na itong sumabak sa local showbiz scene. Nitong nakaraang Biyernes, January 25, pormal nang inanunsiyo ni Gabriela ang balak niyang mag-pursue ng kanyang career sa Pilipinas sa isang press conference na ginanap sa Novotel Hotel sa Araneta Center, Cubao, Quezon City. Ang talent manager at Miss World Philippines National Director na si Arnold Vegafria ang magiging business manager ni Gabriela para sa mga proyekto nito para sa Pilipinas at iba pang bahagi ng Asia. Sa isang maiksing mensahe, ibihagi ni Arnold na mayroon nang dalawa o tatlong endorsement deals na nakahain para kay Gabriela. Aniya, "She has the heart of a Filipina. She likes the Philippines, she likes Asia. "That's the reason why these companies are eager to support her passion in promoting not only the Miss Universe, but the Philippines as well." Bukas ang pinto ni Gabriela sa kung ano pang proyekto ang darating sa kanya ngunit isa sa mga nais nito ay ang magkaroon ng kanyang sariling talk show na magsisilbing inspirasyon sa iba pang kababaihan. Pahayag niya, "I love hosting, actually. "I love hosting because I think we need to bring real stories in to real life. "I'm looking forward to… If God would give me the opportunity to have a show or something, just to bring women's stories that empower other women to pursue their dreams. "I think we have so many women with talent, with extraordinary abilities, that have not showed that to the world." 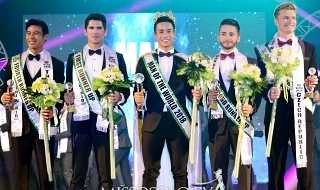 Kung sakaling mabibigyan ng pagkakataon, ang current Miss Universe titleholder na si Catriona Gray ang nais nitong maging unang guest sa kanyang talk show. Dagdag ng 30-year-old former beauty queen, "For a former titleholder to a new titleholder, why not?" Ano naman kaya ang mga itatanong niya kay Catriona? Lahad niya, "I have to make a list, but like how different it is right now, because this is the era of women and the empowerment they have. "You have so many movements like #MeToo, and this is the time to take advantage of that movement, so I will see." Sa ngayon, busy din si Gabriela bilang isa sa mga national director ng Miss Venezuela Organization. 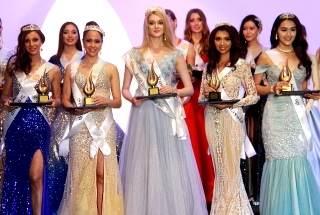 Samantala, nagbigay din ng pahayag si Gabriela sa naging performance ni Catriona sa Miss Universe 2018 pageant na ginanap sa Bangkok, Thailand noong nakaraang December 17. Nitong mga nakaraang araw, napabilib si Gabriela sa ginawang paghahanda ni Catriona para sa nasabing pageant. Pag-amin niya, "I saw all the previous training that she had. "I saw her like practicing the walk, practicing the make-up, practicing everything. "I think she was so well-prepared for that night. 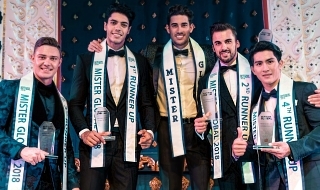 "And having to actually work before with Arnold and the Miss World Organization, I think it allows her to have more training and more preparation. "And she said that every step that she made, she did it with a grateful heart because she knows how it feels when she didn’t place." Nakaka-relate din si Gabriela kay Catriona dahil halos pareho din daw sila ng pinagdaanan sa mga unang buwan nang sila'y itanghal na Miss Universe. Kuwento niya, "It happened the same to me. We won almost close to December and the Christmas time. "So usually, they say, 'Go home, stay quiet.' So I saw that for her first week, she was like, very quiet. "I think she was here in the Philippines with her family and now she's more active. "Now, she's doing the UC-1000 commercial, I saw her first media week. She was impeccable, very beautiful. "I think she did a good job with all the media. She has a very authentic personality." 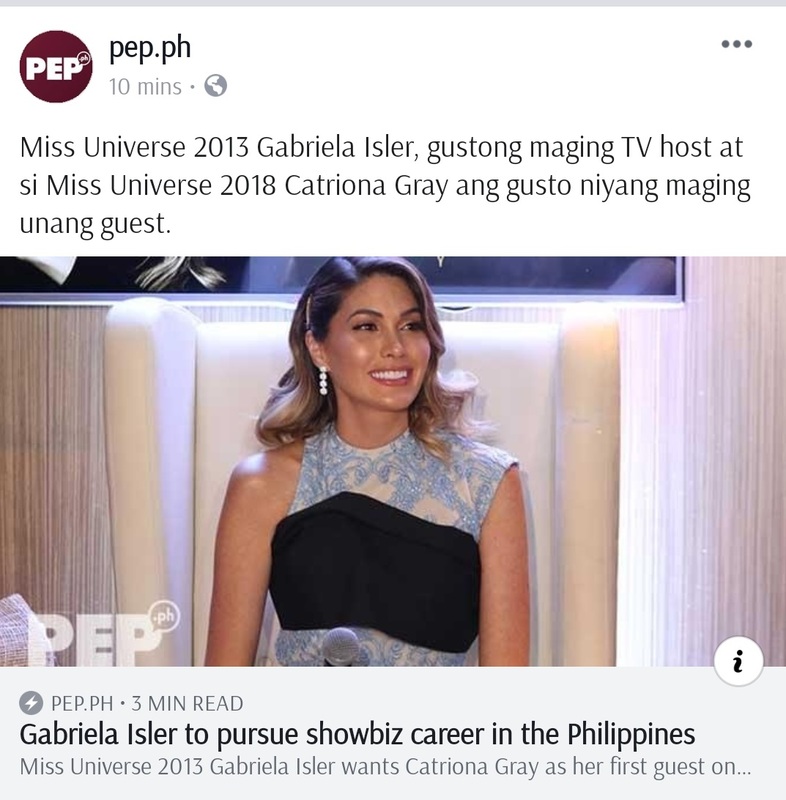 Buo naman ang tiwala ni Gabriela kay Catriona na magiging magaling itong representative ng Miss Universe Organization. Paliwanag ni Gabriela, "I think she’s a very humble and very smart girl and a very good representative of your culture and I think she’s gonna do a great job. "And more than that, very focused on her role for that community—to give back, to compromise their voice, strength, and effort for those that need it. "That’s what we need. We need women to empower all the women and we need women who actually inspire, so I think she’s gonna do a good job." ONE OF THE BEST MISS UNIVERSE. Good for her! Venezuela is in crisis right now and everybody is fleeing away for food and safety. I thought she the ND of MVU. If she is trying her luck in PH then who will oversee the organization? Anyway i know PH love beauty queens especially Miss U title holder, i know she will love PH even more. few days back i had watched documentary about her country's crisis, so may people are fleeing in neighboring country like Colombia. I hope the crisis will soon be over. Good luck to her and god bless her too. How can she do both things, career in the PH showbiz and national pageant director of Venezuela? She might be able to but one will be neglected. There are no job opportunities in her home country, so she ventures outside for more work. She just needs to learn speaking Tagalog. Like Dayanara Torres, this could be temporary and she’ll go back to her country when current crisis improves. Eligible Pinoy bachelors are lining up. I am hoping she will find a rich, decent, non-showbiz Pinoy guy as her future husband. She deserves a supportive, loving, financially stable and one-woman man / husband. Her country in is turmoil so she finds a place where she can make money. JamesCedricLim wrote: I thought she the ND of MVU. If she is trying her luck in PH then who will oversee the organization? Anyway i know PH love beauty queens especially Miss U title holder, i know she will love PH even more. Venezuela has two presidents right now, one was sanctioned by the US and the other by Russia and China. Hopefully, this governance conflict will be resolved soon, otherwise a civil war could arise. I WANT THE COUNTRY VENEZUELA BE DIVIDED INTO 2: NORTH VENEZUELA AND SOUTH VENEZUELA SIMILAR TO KOREA! -TO END ALL CONFLICTS. ..HOPEFULLY THEIR'S A REFERENDUM! She's the ND of Miss Venezuela right? So... How will she handle both? JaninaCruz-Vega wrote: She's the ND of Miss Venezuela right? So... How will she handle both? SHE WANTS OUT OF VENEZUELA MOST PROBABLY. I HOPE THIS BOTOX QUEEN ARNOLD VIAGRAFRIA WONT SCREW GABRIELA ISLER. MISS VIAGRAFRIA IS A SHADY CHARACTER.. THE HYPER INFLATION IS TOO MUCH!..100000000% PERCENT!..IT'S NOT SURPRISING WHY ALL VENEZUELAN QUEENS FLED THEIR COUNTRY!...YOU LINED UP FOR 12 HOURS (3am - 3pm) TO THE NEAREST GROCERY STORES JUST TO BUY 1 KILO OF FLOUR AND 2 LOAVES OF BREAD. THAT IS IF YOU'RE LUCKY!..MOST OF THE TIME IT'S OUT OF STOCK!...MILLIONS OF VENEZUELANS FLED TO NEIGHBORING COUNTRIES: COLOMBIA, PERU, ECUADOR, BRAZIL, MEXICO...ONE MILLION VENEZUELAN REFUGEES SEEK SHELTER IN COLOMBIA ALONE. TRAVELLED BY FOOT!...QUE HORROR!